Museum of Florida Arts and Culture curator Mollie Doctrow, the mind behind the Wildflower Wayside Shrine Trail, holds two original carvings that were used to make the polyurethane covers for nine shrine boxes. A deep appreciation of nature is the driving force behind everything Mollie Doctrow does as an artist, a printmaker and curator of South Florida State College’s Museum of Florida Art and Culture. As MOFAC’s curator for the past nine years, Doctrow has selected and promoted exhibits, artist and programs. Her administrative duties also include developing schedules and designing museum displays. “I’m the director and designer, but I rely on a lot of help from my two paid interns and a team of volunteers,” Doctrow said. 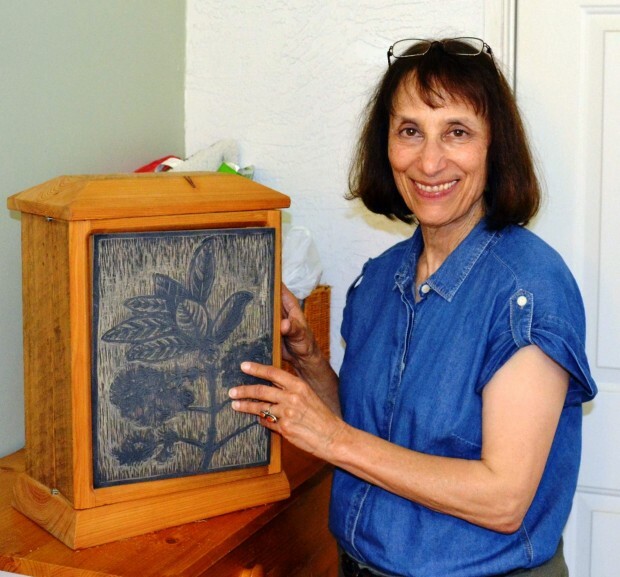 She is also the creative mind behind the Wildflower Wayside Shrine Trail, a self-guided walking trail that was established at SFSC and Archbold Biological Station about three years ago. The trail has a series of nine cypress wood boxes that contain botanic information and artist renderings of some of the rare and endangered plant life along Florida’s Lake Wales Ridge. The shrine covers are polyurethane reproductions of some of her original carved wood blocks. “Mollie is really great,” said retired marine biologist and museum volunteer Linda New, as she pointed out one of shrine boxes at SFSC during the March 13 kick-off of the Pygmy Fringe Tree Wildflower Festival, an event Doctrow founded. “There is a lot going on, with her bringing in all the Florida artists and cultural exhibitions,” New said. Aufiery’s bold, colorful paintings depict wild Florida landscapes and the places in between – the bridges, streets and railroad crossings that connect and separate man and nature. The group exhibition features art related to Florida’s Lake Wales Ridge, a 150-mile strip of highlands formed one to three million years ago. This unique habitat, its flora and fauna are captured in photographs, prints, carvings and paintings by local artists Reed Bowman, Maija Baines, Cathy Futral, Tom Freeman, Allen McPherson, David Price and Doctrow. Doctrow, who graduated with bachelor’s degree in philosophy and a master’s in studio art from California State University at Northridge in 1975, views her art as an avenue of discovery, a personal in-the-moment interaction with her subject and a way in which to question the purpose of life. A former professor of art at Brevard College in North Carolina, Doctrow described her trips to the Big Cypress Preserve and Everglades National Park and the two artist residencies that followed as “serendipitous events” that convinced her to move to Florida. Doctrow still teaches a two-dimensional design and computer graphics class each semester and shares her expertise of the Lake Wales Ridge, the Wildflower Wayside Trail and her unique woodcut process during speaking engagements. Her process entails sketching on location, carving her designs into Japanese shina wood and then inking the block woodcuts to make black-and-white prints at her home studio. Her Sebring home has been turned into a comfortable workspace, with a carving studio just off her living room and printing presses set up in her converted garage. Doctrow’s work has been featured in numerous group and solo exhibitions.